Surf Expo is the biggest watersports and beach lifestyle tradeshow in the world. Since 1976, retailers have come together in one location to discover new trends and brands that would sell well in their shops and boutiques. 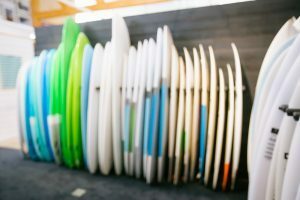 On September 6-8, buyers from specialty stores from all over the world will be visiting Orlando for the annual Surf Expo. More than 2,500 booths of apparel and goods will be present. Also included is a full line-up of special events, including fashion shows, award ceremonies, and product demonstrations. Wind – wind-related boarding items including kites, boards, sails, booms, etc. The show will be held at the Orange County Convention Center on International Drive. Hours are Noon – 5 p.m. on Wednesday, 9 a.m. – 6 p.m. Thursday and Friday, and on Saturday from 9 a.m. – 4 p.m. If you’re attending the Surf Expo this September, book your stay at the Rosen Inn International. We are located just 1.6 miles away from the Convention Center. We’re also close to all I-Drive’s famous attractions. Reserve your room today by calling 407-996-1600.